The Medusa, a government vessel, had foundered off the West African coast and 150 people tried to escape on a raft. After thirteen days, only fifteen were rescued alive. They had had nothing but a few drops of wine - and human meat - to sustain them. The tragedy was blamed on official negligence and created a political scandal. This incident was the result of tragic mismanagement and provoked scandal in France when the survivors were able to tell their stories. 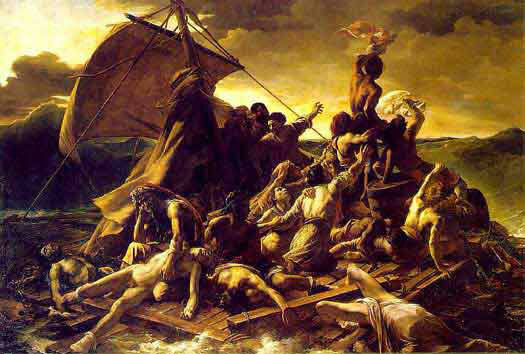 Gericault's depiction of the anguish of the event was construed by the government as an outright political attack. Though the painting was titled simply Shipwreck, all the visitors knew its real subject. Critics either condemned or praised it depending on their political rather than their artistic leanings. Disappointed by the lack of artistic appreciation, Gericault lapsed into depression. But in 1820, Gericault took this huge canvas to London where it met with considerable success in exhibitions.